The Nik Meller Collection of elegant premium grade optic crystal Awards are designed by International furniture designer and sculptor Nik Meller. 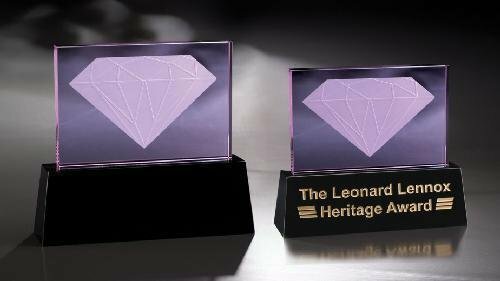 The Carat Crystal Award displays a beautifully diamond silhouette showcased in a shadowy purple crystal rectangle. The midnight black crystal base is carved in the shape of a trapezoid holding firmly the center piece. The Carat Award highlights excellence worthy of recognition. Available in one standard size. Custom sizes and multiple color combinations available upon request. Casa Verde is part of the Chien J. Wang Collection designed by international designer Chien J. Wang. Mimicking the modern business park design, Chien keeps this piece very simple. Two mirror strips are added as the design element.